Our extension in Seddon is nearing completion and the clients are looking forward to moving in. Their new home will be a modern, energy efficient, functional home with the luxury of an indoor toilet - the old dunny will stay too. The extension to the rear of the existing bluestone cottage will add a modern twist to the old heritage property. The internal courtyard and extended grounds will flood the house with natural light and open the house to the outdoors. We’ll keep you updated on this interesting project but in the meantime have a look at the project page here. The Warrandyte Outlook is one of our new projects that is currently under construction. Set along the contours of a sloping site and surrounded by eucalypt trees the site looks out over Warrandyte State Park in Victoria. The outlook sets the stage for the layout of the house optimising the views through a multi-level system that hugs the hillside. The brief was to create a multi-generational 3 bedroom family house for entertaining and enjoying the long views over Warrandyte State Park whilst maintaining the lush greenery surrounding the area. The efficiency of the design is based on the northern orientation of the property, where passive solar design is optimised through high performance glazing and effective shading. Creating a low energy usage home through the use of our super insulated building fabric and other integrated energy systems. We’ll keep you updated on the progress but in the meantime take a look at the new project page which includes more details about the brief here. Watch this short video of temperature anomalies in countries around the world from 1880-2017, created by researcher Antti Lipponen from the Finnish Meteorological Institute. The timeline shows countries experiencing unusual temperature variations from 1880-2017, by the end of the video all the countries start turning red as they experience above-average temperature spikes - a clear and scary indication of climate change. We were excited to receive the latest magazine from Built Offsite this week as we were featured in the article "Smart Panels: Multi-Faceted Benefits". Chris Barnett spoke to Built Offsite's writer Beverley Johanson on Habitech, how the company came about and the benefits of building with our SIPs panels. Master Builders 2018 Green Living Conference is being held in Melbourne this Friday 31 August and our Managing Director Chris Barnett will be one of the speakers. The conference is held annually and discusses a range of sustainability topics of special interest to the building and construction industry. This year the topic is energy efficient building practises, the latest methods and materials. Chris' talk is titled "Performance: more than hot air" - Designing and delivering buildings constructed with our modular flat-packed panel system. Chris will discuss how we are actively monitoring the energy performance of our houses and how the system can be used to cost effectively meet Passive House performance standards. Passive House is today’s most energy efficient building standard, and with a number of Passive House projects underway and enquiries growing we thought it was a good time to create a Passive House page. The Victorian Government have recently developed a Residential Efficiency Scorecard for Victorians to better understand the energy performance of their homes and how they can improve the quality of their living environment whilst saving money on their energy bills. An accredited assessors would use the government supported scorecard webtool to rate the energy efficiency of your home and provide a star rating just like your fridge or washing machine. Check out the video below to give you a quick intro and find out more about the scorecard and how you can get your house assessed here. How do you get a truly energy-efficient home, and can smart home technologies help or make things worse? Take a listen to a recent interview with Dr Stephen White, head of the CSIRO's Energy Efficiency Research, and Associate Professor Yolande Strengers, Principal Research Fellow in the Centre for Urban Research at RMIT, on ABC Radio National Making Homes More Energy Efficient here. Dr Stephen White and Associate Professor Yolande Strengers discuss with the host Amanda Smith recent research published by The University of Melbourne, that found that people are willing to pay more for energy efficient housing, making the case for a mandatory national rating system for existing homes. Read the full article here. The Suburban Minimalist House - Almost time to move in! It was a cold day for the final defects meeting at the Suburban Minimalist House. The clients were very happy though and were looking forward to moving in next week. Despite the weather, the inside was warm and comfortable, even without the heating system on, and the large north facing windows of the living area was flooded with light. Energy standards in Australia’s National Construction Code must be urgently upgraded if new buildings are to be fit for a zero carbon future, according to the report released by The Australian Sustainable Built Environment Council (ASBEC) and ClimateWorks Australia. The report, Built to Perform: An Industry Led Pathway to a Zero Carbon Ready Building Code, shows that setting strong energy standards for new buildings in the Code could, between now and 2050, reduce energy bills by up to $27 billion, cut energy network costs by up to $7 billion and deliver at least 78 million tonnes of cumulative emissions savings. Habitech’s Managing Director Chris Barnett is part of the ASBEC Sustainable Housing Task Group which helped to commission this research. You can read the report here. 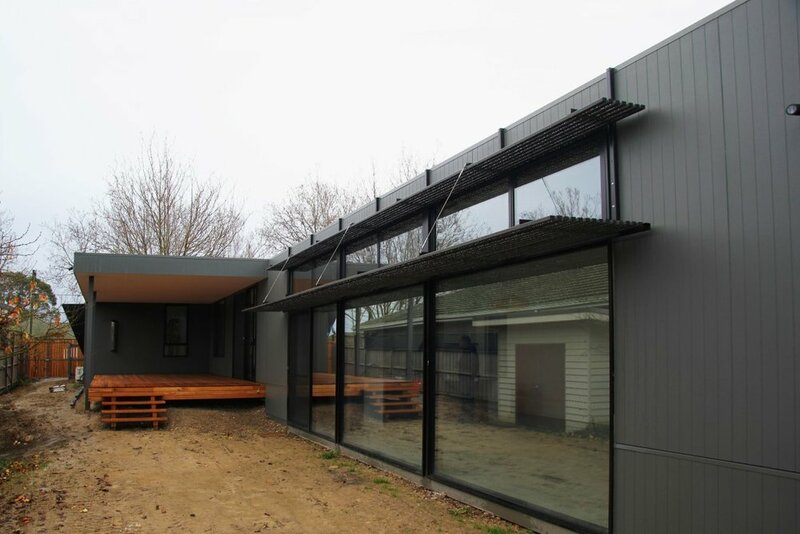 Our New Zealand Pegasus house, a collaborative project with our partner LiteGreen Projects, was featured on PrefabNZ recently for it's energy efficiency and sustainable credentials. The owners extensive research into prefab construction, with it's superior insulation qualities along with efficient build times, brought them to LiteGreen Projects and our structural insulated panel (SIPS) system. Their dream to build a quality, durable home that would be stylish, comfortable, healthy and affordable, built using sustainable design principles was fulfilled and completed end of last year. Panels are up, roof is on, windows are in and the dogs have started exploring... our Beaufort Nimbus House is progressing and owners Marianne and Gail can't wait to move in. The house is located on a former pine plantation and surrounded by eucalyptus forest. Over time the owners intend to rehabilitate the landscape with native planting and a small farm. This is an example of our standard Nimbus design, with smaller versions available too. The house will be completely off-grid with its own solar electricity, rainwater and wastewater treatment systems. It's good to see our Mornington Beach Houses project still getting traction and this time from the global architecture website ArchDaily - The World's most visited Architecture Website. Check out the web page here. Here's a look at one of our collaborative NSW projects under construction. With most of the wall panels already in-place on this rural site, we're not far off creating a fully sealed shell for this family home. The images below show the full extent of the build with three interlocking pavilions, capturing all of the views and sun this stunning site has to offer. "80's nightmare to 21st century dream"
We were pleased to see Lunchbox Architect featured our Lawes Street Extension over the weekend. However they may have been a bit harsh in calling the old 1980's brown brick facade an '80s atrocity, but to be fair the fresh new timber cladding is a vast improvement. Our clients Craig and Robyn, the owners of the Mornington Beach-houses, celebrated their win at the 2018 HIA National Awards, for the "Australian Townhouse / Villa Development of the Year", by inviting us and the builders for some celebratory drinks and a sing-along in their beautiful new home, making use of the fireplace during a cold and wintry evening. Visit the project page here for more info. Congratulations to Craig & Carolyne McPhan from Individual Builders and Craig & Robyn the proud owners of the Mornington Beach-houses. Our Mornington Beach-houses project has just won an award at the 2018 HIA National Awards in Singapore for "Australian Townhouse / Villa Development of the Year" thanks to Craig McPhan and the team at Individual Builders. It was the only Victorian project to win an award this year. This project on the Mornington foreshore consists of two double storey houses on a lot facing Mills Beach and bordering the mouth of Tanti Creek, capturing endless views over Port Phillip Bay with Bush vistas behind. Visit the project page here for more info. This week we feature one of our upcoming extension projects situated next to Elster Creek in the inner suburb of Elwood, Melbourne. The project upgrades the existing dwelling with new kitchen, living room, bathroom and laundry facilities all integrated into a small addition toward the rear. The living areas are surrounded by double glazing and the Habitech Wall Panel System, ensuring high thermal performance year-round. Photos below from our recent site visit show the extension at lock-up stage with a dark grey coat of Dulux paint. Here at Habitech Systems we've been busy growing recently, which means new staff members. We would like to welcome Nooshin Roohani and Emiko Phillips to the Habitech family. Nooshin is appointed as a Senior Architectural Documentor here at Habitech. She comes to us with a great deal of architectural experience and a Masters in Architecture. Nooshin has a strong passion in sustainable and modular design with a fine creative eye for designing environmentally friendly spaces. Emiko is appointed as our Office Administrator, she comes from a environmental science background with a strong interest in sustainability and conservation. Emiko is a passionate environmentalist devoting her spare time volunteering for not-for-profit organisations and bush regeneration groups. Check out all our new and current staff members on our 'About Us' page here. Energy efficiency is one thing, but have you ever thought about the idea of energy productivity? Essentially we are looking at the value delivered from every unit of energy used. 2xEP, an initiative from The Australian Alliance for Energy Productivity (A2EP) is a voluntary and aspirational target for our economy. This stretch target challenges our current products and services, business models and attitudes in order to facilitate a shift towards essentially getting more value out of our energy. At Habitech, we have been privileged enough to feature as a case study in A2EP's latest report categorising us as an 'innovative business system'. The assessment criteria for an increase in energy productivity works alongside Habitech's business goals through using high-performing sustainable materials as well as incorporating optimal structural design in our projects.